Australia Day is not just the official national day when everyone celebrates what they love most about Australia, but the largest annual public event in the nation. There is a long program of events and activities for everyone to enjoy in Melbourne including the official flag raising ceremony, People's March, events in Kings Domain, Alexandra Gardens, Docklands and the traditional fireworks on the 26 January evening. It is also a day to celebrate the great outdoors and open spaces that many locals and visitors have come to love about Australia. What better way to enjoy Australia Day than with a barbeque, live entertainment and a swim off Middle Brighton pier with local sports celebrities, family and friends. In its 4th year, the Australian Unity Great Australia Day Swim hosted by the Brighton Rotary promises to be a great morning out. Helping to host the event is former AFL player and Bayside resident Trent Croad. He share with me that the Australian Unity Great Australia Day Swim is aimed at encouraging the local community to get together on Australia Day to support an amazing cause whilst getting everyone active and promoting water safety. 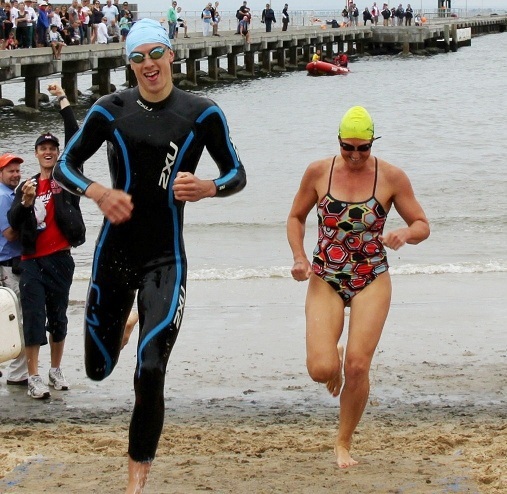 Here are 7 top reasons to grab your partner, kids, swimwear and start your Australia Day celebrations with the Australian Unity Great Australia Day Swim. Thanks to the sponsorship of the good folks at Australian Unity, the efforts of the Rotary Club of Brighton and the support from local sports celebrities and the community, the Australian Unity Great Australia Day Swim is free for everyone to attend. 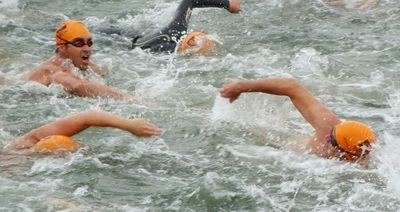 A small contribution is required to enter in the swim events. In addition to Trent Croad, former AFL player and Bayside resident who's hosting the main event, Olympic medal winning swimmer Michael Klim and his Olympic swim team will be the stars of the MILK celebrity relay. You can expect to meet Olympic and National Title swimmers including Daniel Kowalski, Liesel Jones, Nicole Livingstone, John and Tammy Van Viesse, Sophie Eddington and Matt Targett. 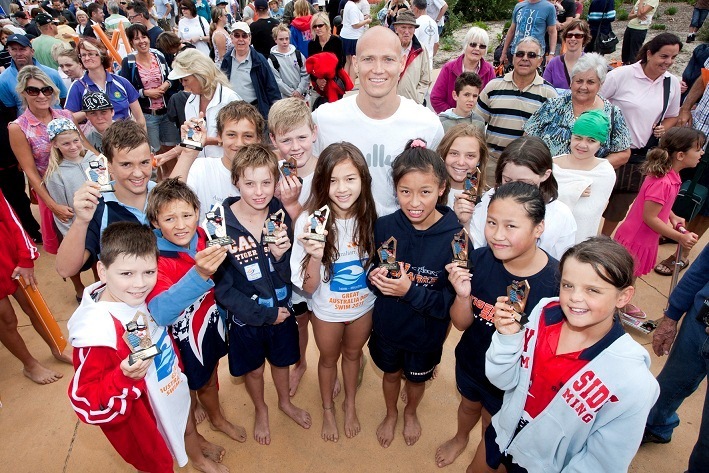 The 400 metre swim relay in 2012 was won by team Targett comprising Matt Target, John and Tammy Van Wisse and Jakab Andkjaer so we can likely expect some friendly competition from Michael Klim and other Olympians for the top spot in 2013. The organisers have introduced a 650 metre Intermediate Swim, for juniors who want to expand their Open Water capability and adults preferring a shorter course for the Australian Unity Great Australia Day Swim in 2013. 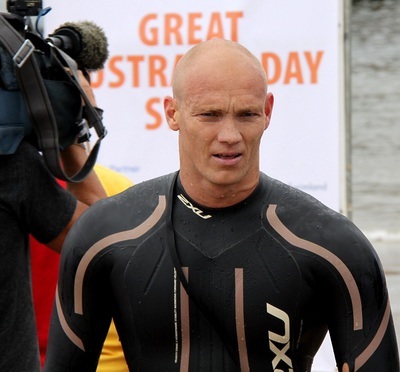 The Australian Unity Great Australia Day Swim is not just for adults. It is a way to encourage all parents to give their children the opportunity to learn to swim. 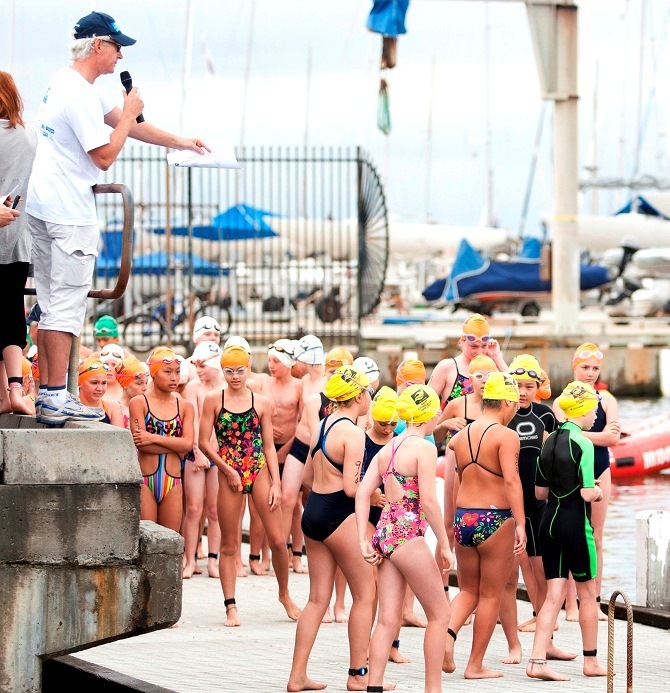 It's also about helping kids to enjoy swimming and learn open water skills at the same time. Paul Sadler, owner of Paul Sadler Swimland (PSS) and water safety advocate shared that it is important to offer children variety in a fun and motivating environment when teaching swimming and water survival skills. Many kids train and practise their swimming skills in a protected pool environment, whereas this event gives the children an opportunity to apply their skills in a more challenging open water environment that is appropriately supervised. Sponsored by PSS and organised in association with Swim Australia and it's affiliated swim schools and swim clubs, the Swim Australia Junior Dash introduced in 2011 was especially designed for children between 9 to 11 years where more than 70 children competed alongside Olympic swimmers Michael Klim and Matthew Targett and distance specialists Tammy and John Van Wisse. The kids swam alongside the Brighton Pier for approximately 350 m before swimming ashore and dashing to the finish line in front of a large crowd. 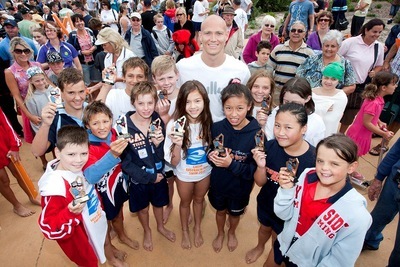 Swimming legend Michael Klim also encourage parents to enter their children in the Junior Dash as a healthy lifestyle and confidence-builder in ocean swimming. He shared that swimming not only gave him the opportunity to represent Australia at the highest level but it taught him some invaluable life lessons such as perseverance, camaraderie, dedication and a passion to pursue a goal. 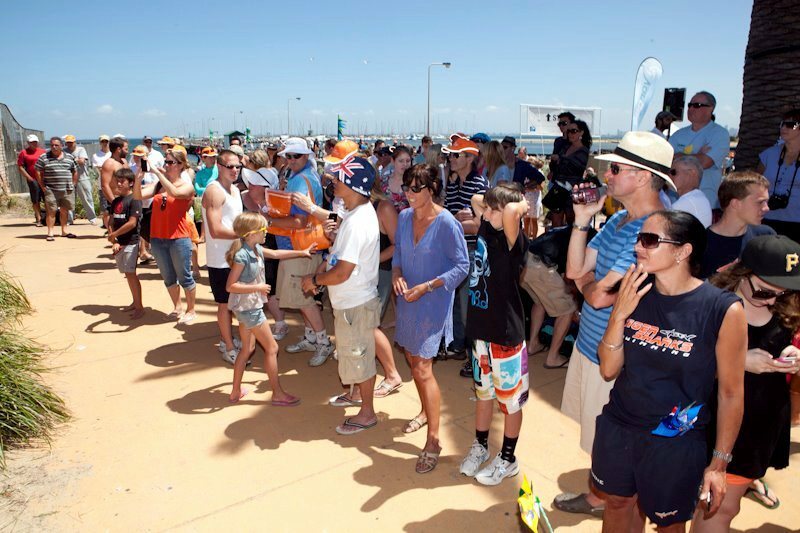 Regardless of whether you're family and friends of the swimmers or just taking your kids to view the excitement, the Australian Unity Great Australia Day Swim promises a day of fun with food, drinks, ice cream and a live band to keep everyone entertained. To ensure the water-side activities proceed safely for adults and kids, the Brighton Life Saving Club will be supervising all water safety. Apart from being an Australian Day sporting event, The Australian Unity Great Australia Day Swim is also supporting the continued well being of local communities by raising money for worthy causes. All proceeds go to charities largely for children from disadvantaged homes and those in crisis such as Les Twentyman's 20th Man. This year's major charity is Bayside Community Information and Support Services (BayCISS) which relies on volunteers to support those in the Bayside community who are going through difficult times. In 2011, BayCISS assisted approximately 6,000 residents in the form of food vouchers and food hampers. It distributed more than 100 Christmas hampers with donated foods to enable families and those alone to enjoy a some Christmas cheer. It also assist families who cannot afford the education expenses of their children. 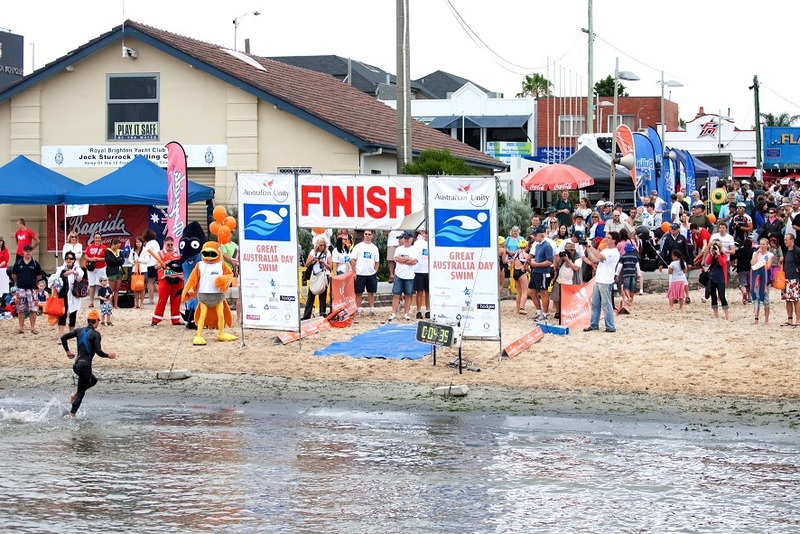 If you have swam in the Australian Unity Great Australia Day Swim in previous years, this is another opportunity to beat your personal best. 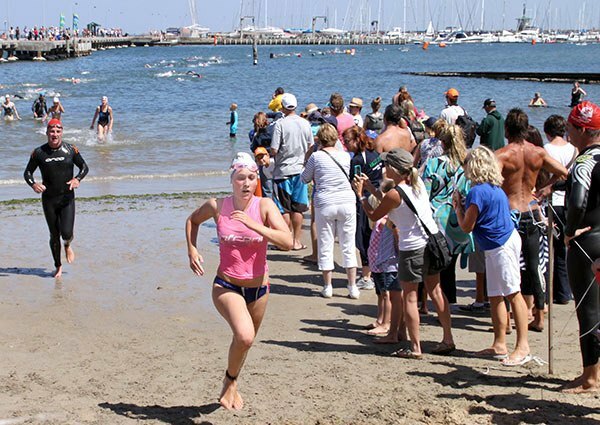 If you haven't entered a swim event before, here's an excellent opportunity to join in the fun. You will receive a complimentary gear bag, event T shirt, sports cap, swim cap, Powerade drink, fruit and ice cream while helping to raise funds for disadvantaged children. You will also enter the draw to win AUD5,000 of prizes including 6 nights at Club Med Bali from Brighton Travelworld, and super prize-packs on the day. With 5 different swimming events rolled into 1 great swim meet at the Australian Unity Great Australia Day Swim, over 2,000 locals are expected to swim on the day with another 1,000 joining to enjoy the entertainment and barbeque. The 5km swim commences at 9am followed by the Junior Dash at 9.30am and the 650m Intermediate Swim at 9.45am, 1400 metre Swim at 11 am and the MILK celebrity relay at midday. Readers who are interested to join in the Australian Unity Great Australia Day Swim for themselves or their kids should register and make payment online. Entries are open until 5pm on 24 January 2013. Although entries can be made at the registration tent on the day, availability is subjected to the maximum entry numbers not reached prior to race day.